The H-cluster reductions are various consonant reductions that have occurred in the history of English, involving consonant clusters beginning with /h/ that have lost the /h/ (or become reduced to /h/) in some or all dialects. Reduction to /h/ before rounded vowels (due to /hw/ being perceived as a /h/ with the labialization characteristic of that environment). This occurred with the word how in the Old English period, and with who, whom and whose in Middle English (the latter words having had an unrounded vowel in Old English). Reduction to /w/, a development that has affected the speech of the great majority of English speakers, causing them to pronounce ⟨wh-⟩ the same as ⟨w-⟩ (sometimes called the wine–whine merger or glide cluster reduction). The distinction is maintained, however, in Scotland, most of Ireland, and some Southern American English. The Old English consonant clusters /hl/, /hr/ and /hn/ were reduced to /l/, /r/, and /n/ in Middle English. For example, Old English hlāf, hring and hnutu become loaf, ring and nut in Modern English. In some dialects of English the cluster /hj/ is reduced to /j/, leading to pronunciations like /juːdʒ/ for huge and /ˈjuːmən/ for human, and making hew a homophone of ewe or you. This is sometimes considered a type of glide cluster reduction, but it is much less widespread than wh-reduction, and is generally stigmatized where it is found. Aside from accents with general H-dropping, in the United States this reduction is mostly found in accents of Philadelphia and New York City; it also occurs in Cork accents of Irish English. In other dialects of English hew and yew remain distinct; however, the cluster /hj/ of hew, human, etc. is often reduced from [çj] to just [ç] (a voiceless palatal fricative). Y-cluster reductions are reductions of clusters ending with the palatal approximant /j/, which is the sound of ⟨y⟩ in yes, and is sometimes referred to as "yod", from the Hebrew letter yod(h), which has the sound [j]. Many such clusters arose in dialects in which the falling diphthong /ɪu/ (the product of the merger of several Middle English vowel sequences) became the rising diphthong /juː/. (For more information, see Phonological history of English high back vowels.) They were thus often found before the vowel /uː/, as in cube /kjuːb/ – which was in some cases modified to /ʊə/ or /ʊ/ before (historical) /r/, as in cure, or weakened to /ʊ/ or /ə/ as in argument. They also occurred in words ending in -ion and -ious, such as nation and precious. This change from /ɪu/ to /juː/, which had occurred in London by the end of the 17th century, did not take place in all dialects. 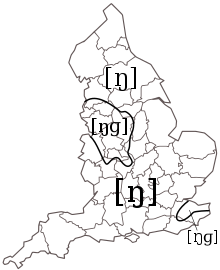 A few dialects, notably in Wales, as well as in some parts of northern England, New England and the American South, still retain a (falling) /ɪu/ diphthong where standard English has /juː/ – these dialects therefore lack the clusters with /j/ and have not been subject to the reductions described here. The diphthongs /juː/ or /ɪʊ̯/ are most commonly indicated by the spellings eu, ew, uCV (where C is any consonant and V is any vowel), ue and ui, as in feud, few, mute, cue and suit, while the historical monophthong /uː/ is commonly indicated by the spellings oo and ou, as in moon and soup. Yod-dropping is the elision of the /j/ from certain syllable-initial clusters of the type described above. Particular cases of yod-dropping may affect all or some of the dialects which have the relevant clusters. Conversely an initial /j/ does not appear in Welsh English before /iː/ in words such as yeast and yield. Glide retention in these contexts has occasionally been held to be a shibboleth distinguishing Canadians from Americans. However, in a survey conducted in the Golden Horseshoe area of Southern Ontario in 1994, over 80% of respondents under the age of 40 pronounced student and news without yod. 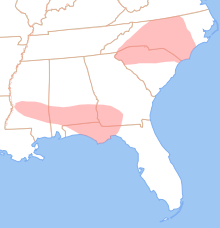 The areas marked in pink show parts of the United States where a distinction between /ɪʊ̯/ in dew and /uː/ in do may be made. General American thus undergoes yod-dropping after all alveolar consonants. Some accents of American English, however, preserve the distinction in pairs like loot/lute and do/dew, because (as in the Welsh English dialects discussed above) they retain a diphthong /ɪʊ̯/ in words where RP has /juː/, thus /luːt~lɪʊ̯t/, /duː~dɪʊ̯/, etc. Yod-dropping after /t/, /d/ and /n/ was also a traditional feature of Cockney speech, and this continues to be the case after /n/, although after /t/ and /d/ yod-coalescence is now more common. Some East Anglian accents such as Norfolk dialect extend yod-dropping not only to the position after /t/, /d/ or /n/, but to the position after nonalveolar consonants as well, so that pairs like beauty/booty, mute/moot, cute/coot can be homophonous. A well-known series of UK television advertisements beginning in the 1980s featured Bernard Matthews describing his turkeys as "bootiful" (for beautiful). Such accents only pronounce a /j/ in words like "use", "unit" etc. where there is no consonant before the /j/. Luke look ˈluːk With foot–goose merger. suit soot ˈsuːt With foot–goose merger. fuel fool ˈfuːl With vile–vial merger. Coalescence can even occur across word boundaries, as in the colloquial "gotcha" (for got you) and "whatcha" (for what you). This can lead to additional homophony; for instance, dew and due come to be pronounced the same as Jew. These words are pronounced as homophones in most accents of British English. Yod-coalescence has traditionally been resisted in RP. While it has certainly become established in words of the first group listed above (nature, soldier, pressure, etc. ), it is not yet universal in those of the second group (educate, etc. ), and does not generally occur in those of the third group. duty Judy ˈdʒuːɾi With intervocalic alveolar flapping. List of yod-dropping and coalescence homophones on Wiktionary. Old and Middle English had an initial /wr/ cluster, hence the spelling of words like write and wrong. This was reduced to just /r/, apparently during the 17th century. An intermediate stage may have been an [r] with lip rounding. As a result of this reduction, pairs of words like rap and wrap, rite and write, etc. are homophones in practically all varieties of Modern English. They remain distinct in the Doric dialect of Scots, where the wr- cluster is pronounced /vr/. Old English also had a cluster /wl/, which reduced to /l/ during Middle English. For example, the word lisp derives from Old English wlisp(ian). Middle English initial /kn/ is reduced in modern English to /n/, making pairs like knot/not and knight/night homophones. The /kn/ cluster was spelled cn- in Old English; this changed to kn- in Middle English, and this spelling survives in Modern English, despite the loss of the /k/ sound. Cognates in other Germanic languages usually still sound the initial /k/. For example, the Old English ancestor of knee was cnēo, pronounced /kneːo̯/, and the cognate word in Modern German is Knie, pronounced /kniː/. The song The Gnu jokes about this silent g and other silent letters in English. In fact the g in gnu may always have been silent in English, since this loanword did not enter the language until the late 18th century. The trumpeter Kenny Wheeler wrote a composition titled Gnu High, a pun on "new high". According to Wells, these reductions occur only in the broadest creole. NG-coalescence is a historical sound change by which the final cluster /nɡ/, pronounced [ŋɡ] (the /n/ being realized as a velar nasal by assimilation with the velar /ɡ/), came to be pronounced as just [ŋ] – that is, the final [ɡ] was dropped, but the velar quality of the nasal remained. The change took place in educated London speech around the end of the 16th century, and explains why there is no [ɡ] sound at the end of words like fang, sing, wrong and tongue in the standard varieties of Modern English. The change in fact applies not only at the end of a word, but generally at the end of a morpheme. If a word ending in -ng is followed by a suffix or is compounded with another word, the [ŋ] pronunciation normally remains. For example, in the words fangs, sings, singing, singer, wronged, wrongly, hangman, there is no [ɡ] sound. An exception is the comparative and superlative forms of adjectives: in the words longer/longest, stronger/strongest, younger/youngest, the [ɡ] is pronounced in most accents. In other cases (when it is not morpheme-final), word-internal -ng- does not show the effects of coalescence, and the pronunciation [ŋɡ] is retained, as in finger and angle. This means that the words finger and singer do not rhyme in most modern varieties of English, although they did in Middle English. The process of NG-coalescence might therefore be referred to as the singer–finger split. Some accents, however, do not show the full effects of NG-coalescence as described above, and in these accents sing may be found with [ŋɡ], the suffix -ing may be pronounced [ɪŋɡ] (though G-dropping is another possibility), and singer may rhyme with finger. This is particularly associated with English English accents in an area of northern England and the Midlands, including the cities of Birmingham (see Brummie), Manchester, Liverpool (see Scouse), Sheffield and Stoke-on-Trent. It is also associated with some American English accents in the New York City area. On the other hand, in some accents of the west of Scotland and Ulster, NG-coalescence is extended to morpheme-internal position, so that finger is pronounced /'fɪŋər/, thus rhyming with singer (although the [ɡ] is not dropped before a stressed syllable, as in engage). It is because of NG-coalescence that /ŋ/ is now normally regarded one of the phonemes of standard English. In Middle English, the [ŋ] can be regarded as an allophone of /n/, occurring before velar consonants, but in Modern English, in view of minimal pairs such as pan–pang and sin–sing, that analysis no longer appears to hold. Nevertheless, some linguists (particularly generativists) do regard a word like sing as being underlyingly /sɪnɡ/, positing a rule that deletes [ɡ] after a nasal before a morpheme boundary, after the nasal has undergone assimilation. A problem with this view is that there are a few words in which [ŋ] is followed neither by a velar nor a morpheme boundary (such as gingham, and dinghy and Singapore for those speakers who pronounce them without [ɡ]), and some in which the [ɡ] is not deleted before a morpheme boundary (longer etc., as noted above). The above-mentioned accents which lack NG-coalescence may more easily be analyzed as lacking a phoneme /ŋ/. The same may apply to those where NG-coalescence is extended to morpheme-internal position, since here a more consistent [ɡ]-deletion rule can be formulated. G-dropping is a popular name for the feature of speech whereby /n/ is used in place of the standard /ŋ/ in weak syllables. This applies especially to the -ing ending of verbs, but also in other words such as morning, nothing, ceiling, Buckingham, etc. G-dropping speakers may pronounce this syllable as [ɪn] or [ən] (reducing to a syllabic [n] in some cases), while non-G-dropping speakers have /ɪŋ/, or more rarely /əŋ/ or /iŋ/. Relative to the great majority of modern dialects, which have NG-coalescence, G-dropping does not involve the dropping of any sound, simply the replacement of the velar nasal with the alveolar nasal. The name derives from the apparent orthographic consequence of replacing the sound written ⟨ng⟩ with that normally written ⟨n⟩. The spelling -in' is sometimes used to indicate that a speaker uses the G-dropping pronunciation, as in makin' for making. The pronunciation with /n/ rather than /ŋ/ is a long-established one. Old English verbs had a present participle in -ende and a verbal noun (gerund) form in -ing(e). These merged into a single form, written -ing, but not necessarily spoken as such – the /n/ pronunciation may be inherited from the former distinct present participle form. The /n/ variant appears to have been fashionable generally during the 18th century, with the alternative /ɪŋ/ being adopted in educated speech around the 1820s, possibly as a spelling pronunciation. Today, G-dropping is a feature of colloquial and non-standard speech of all regions, including stereotypically of Cockney, Southern American English and African American Vernacular English. Its use is highly correlated with the socioeconomic class of the speaker, with speakers of lower classes using /n/ with greater frequency. It has also been found to be more common among men than women, and less common in more formal styles of speech. Heedless running to thy ruin? 'Twill just new dye the lining. In later Middle English, the final cluster /mb/ was reduced to just /m/ (the plum-plumb merger). This affects words such as lamb and plumb, as well as derived forms with suffixes, such as lambs, lambing, plumbed, plumber. By analogy with words like these, certain other words ending in /m/, which had no historical /b/ sound, had a silent letter ⟨b⟩ added to their spelling by way of hypercorrection. Such words include limb and crumb. Where the final cluster /mn/ occurred, this was reduced to /m/ (the him-hymn merger), as in column, autumn, damn, solemn. (Compare French automne, where the cluster has been reduced to /n/.) Both sounds are nonetheless still pronounced before vowels in certain derivatives, such as autumnal and solemnity. General reduction of final consonant clusters occurs in African American Vernacular English and Caribbean English. The new final consonant may be slightly lengthened as an effect. The plurals of test and desk may become tesses and desses by the same rule that gives plural messes from singular mess. When a consonant cluster ending in a stop is followed by another consonant or cluster in the next syllable, the final stop in the first syllable is often elided. This may happen within words or across word boundaries. Examples of stops that will often be elided in this way include the [t] in postman and the [d] in cold cuts or band saw. Historically, similar reductions have taken place before syllabic consonants in certain words, leading to the silent ⟨t⟩ in words like castle and listen. This change took place around the 17th century. In the word often, the [t] sound later came to be re-inserted by some speakers as a spelling pronunciation. An earlier reduction that took place in early Middle English was the change of /ts/ to /s/ (the sent-cent merger). This led to the modern sound of soft ⟨c⟩. For many speakers, an epenthetic [t] is inserted in the final cluster /ns/, making it identical or very similar to the cluster /nts/. For example, the words prince and prints have come to be homophones or nearly so. The epenthesis is a natural consequence of the transition from the nasal [n] to the fricative [s]; if the raising of the soft palate (which converts a nasal to an oral sound) is completed before the release of the tongue tip (which enables a fricative sound), an intervening stop [t] naturally results. The merger of /ns/ and /nts/ is not necessarily complete, however; the duration of the epenthetic [t] in /ns/ has been found to be often shorter (and the [n] longer) than in the underlying cluster /nts/. Some speakers preserve a clearer distinction, with prince having [ns], and prints having [nts] or [nʔs]. The epenthesis does not occur between syllables, in words like consider. The merger of /nz/ and /ndz/ is also possible, making bans and pens sound like bands and pends. However, this is less common than the merger of /ns/ and /nts/ described above, and in rapid speech may involve the elision of the /d/ from /ndz/ rather than epenthesis in /nz/. An epenthetic [p] often intervenes in the cluster /mt/ in the word dreamt, making it rhyme with attempt. Some originally epenthetic consonants have become part of the established pronunciation of words. This applies, for instance, to the /b/ in words like thimble, grumble and scramble. For the insertion of glottal stops before certain consonants, see Glottalization below. Finns fends ˈfɪn(d)z With pen-pin merger. fins fends ˈfɪn(d)z With pen-pin merger. Hans hands ˈhæn(d)z Hans may also be pronounced /ˈhɑːnz/ or /ˈhɑːns/. Heinz hinds ˈhaɪn(d)z Heinz may also be pronounced /ˈhaɪnts/. hence hints ˈhɪn(t)s With pen-pin merger. inns ends ˈɪn(d)z With pen-pin merger. pins pends ˈpɪn(d)z With pen-pin merger. rinse rents ˈrɪn(t)s With pen-pin merger. since cents ˈsɪn(t)s With pen-pin merger. since scents ˈsɪn(t)s With pen-pin merger. tense tints ˈtɪn(t)s With pen-pin merger. tins tends ˈtɪn(d)z With pen-pin merger. Vince vents ˈvɪn(t)s With pen-pin merger. whines winds ˈwaɪn(d)z With wine-whine merger. In English as in other languages, assimilation of adjacent consonants is common, particularly of a nasal with a following consonant. This can occur within or between words. For example, the /n/ in encase is often pronounced [ŋ] (becoming a velar nasal by way of assimilation with the following velar stop /k/), and the /n/ in ten men likely becomes [m], assimilating with the following bilabial nasal /m/. Other cases of assimilation also occur, such as pronunciation of the /d/ in bad boy as [b]. Voicing assimilation determines the sound of the endings -s (as in plurals, possessives and verb forms) and -ed (in verb forms): these are voiced ([z], [d]) following a voiced consonant (or vowel), but voiceless ([s], [t]) after a voiceless consonant, as in gets, knocked. While there are many accents (such as Cockney) in which syllable-final /t/ is frequently glottalized (realized as a glottal stop, [ʔ]) regardless of what follows it, the glottaling of /t/ in clusters is a feature even of standard accents, such as RP. There, [ʔ] may be heard for /t/ in such words and phrases as quite good, quite nice, nights. More precisely, it occurs in RP when /t/ appears in the syllable coda, is preceded by a vowel, liquid or nasal, and it is followed by another consonant except (normally) a liquid or semivowel in the same word as in mattress. Another possibility is pre-glottalization (or glottal reinforcement), where a glottal stop is inserted before a syllable-final stop, rather than replacing it. That can happen before /p/, /t/ and /k/ or also before the affricate /tʃ/. It can occur in RP in the same environments as those mentioned above, without the final restriction so a glottal stop may appear before the /t/, as in mattress. It can also occur before a pause as in quite! spoken alone but not in quite easy. In the case of /tʃ/, pre-glottalization is common even before a vowel, as in teacher. According to Wells, this pre-glottalization originated in the 20th century (at least, it was not recorded until then). Glottalization of /t/ spread rapidly during the 20th century. Final consonant clusters starting with /s/ sometimes undergo metathesis, meaning that the order of the consonants is switched. For example, the word ask may be pronounced like "ax", with the /k/ and the /s/ switched. This example has a long history: the Old English verb áscian also appeared as acsian, and both forms continued into Middle English, the latter, metathesizing to "ask". The form axe appears in Chaucer: "I axe, why the fyfte man Was nought housband to the Samaritan?" (Wife of Bath's Prologue, 1386), and was considered acceptable in literary English until about 1600. It persists in some dialects: for example, in Ulster Scots as /ˈaks/, and in Jamaican English as /ˈaːks/, from where it has entered London speech as /ˈɑːks/. For some speakers of African American Vernacular English, the consonant cluster /str/ is pronounced as /skr/. For example, the word street may be pronounced as /skriːt/. The form has been found to occur in Gullah and in the speech of some young African Americans born in the Southern United States. It is reported to be a highly stigmatized feature, with children who use it often being referred to speech pathologists. Compare yod-dropping and yod-coalescence, described above (and also the coil–curl merger, which features the reverse process, /r/ → /j/). ^ Gimson, A. C. (1980). An Introduction to the Pronunciation of English (3rd ed.). London: Edward Arnold Publishers. ISBN 0-7131-6287-2. ^ Ladefoged, Peter (2001). A Course in Phonetics (4th ed.). Fort Worth, Texas: Harcourt College Publishers. ISBN 0-15-507319-2. ^ Wells (1982), p. 385. ^ Mees, Inger M.; Collins, Beverley (1999). "Cardiff: a real-time study of glottalisation". In Foulkes, Paul; Docherty, Gerard (eds.). Urban Voices. Arnold. p. 192. ISBN 0-340-70608-2. ^ Changes in Progress in Canadian English: Yod-dropping, Excerpts from J.K. Chambers, "Social embedding of changes in progress." Journal of English Linguistics 26 (1998), accessed March 30, 2010. ^ Wells (1982), p. 330. ^ Wells (1982), p. 338. ^ Jespersen, O., A Modern English Grammar on Historical Principles, vol. 1, 12.81-82. ^ Jespersen, O., A Modern English Grammar on Historical Principles, vol. 1, 12.71. ^ a b "Scots Online". Retrieved 31 August 2016. ^ Jespersen, O., A Modern English Grammar on Historical Principles, vol. 1, 12.72. ^ The first recorded use of the word gnu in English dates back to 1777, according to Merriam-Webster's dictionary. ^ Wells (1982), p. 567. ^ Wells (1982), p. 188. ^ Wells (1982), pp. 189, 366. ^ Wells (1982), pp. 60–64. ^ Wells (1982), p. 262. ^ Wells (1982), pp. 17, 19, 26. ^ a b Liberman, Anatoly. "The Oddest and Dumbest English Spellings, Part 15, With a Note on Words and Things". OUP. Retrieved 28 January 2015. ^ Denham, K., Lobeck, A., Linguistics for Everyone: An Introduction, Cengage Learning 2012, p. 162. ^ Algeo, J., Butcher, C. The Origins and Development of the English Language, Cengage Learning 2013, p. 49. ^ Wells (1982), p. 95. ^ Yu, A.C.L., in The Blackwell Companion to Phonology, Wiley 2011, p. 1906. ^ Wells, J.C., "Some day my prints will come", John Wells's Phonetic Blog, 25 August 2010. ^ a b Alan Cruttenden, Gimson's Pronunciation of English, Routledge 2013, p. 99. ^ Nathan, G.S., Phonology: A Cognitive Grammar Introduction, John Benjamins Publishing 2008, pp. 77–78. ^ a b Wells (1982), p. 261. ^ Wells (1982), p. 260. ^ Green, Lisa J. (2002). African American English : a linguistic introduction (1. publ., 4. print. ed.). Cambridge: Cambridge University Press. p. 122. ISBN 978-0521891387. ^ Dandy, E.B., Black Communications: Breaking Down the Barriers, African American Images, 1991, p. 44.